low energy consumption, life time is more than 80,000 hours. Easy to install and change the graphic. Widely be used in shopping malls, hotels, cinemas, restaurants, bars, cafe, family etc. ① Ultra thin frame design can improve the visual effect as well as saving the space. External power supply and energy saving design make you a satisfied bright chioce. ② Light source:3014/4014/2835/5630 SMD LED with 50000 hours life span and LM80 listed, energy-efficient, low heat generation. Low power consumption, energy-saving(up to 70% compared with normal light), high illumination and environment friendly. ③ Wall mounted or counter-top display available. The Single Side Crystal LED Light Box can be put on the desk and you can ajust location of the light box as you want,the light box even can be hanging. 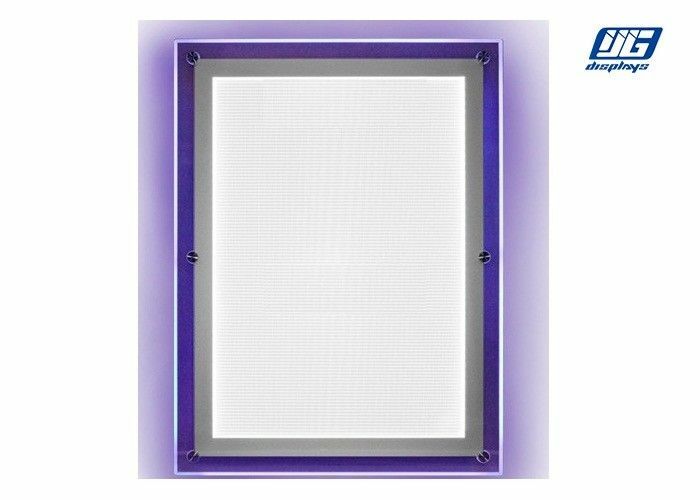 ④ The frame of Single Side Crystal LED Light Box is made of 100% pure clear acrylic,high quality acrylic can provide a magic visual effect when the light box being lighted up. ⑥ Portrait or landscape installation available,different sizes are also available according to the specific needs for a better service provide for all kinds of customs.If you have any ideas,please tell us. ⑦ Unique screws design can provide a stable assembly when the products being installed on the wall or other place,meawhile this design has a better visual effect to improve the whole viewing feeling. ① The CRS Single Side Display Colours Clear Profile Crystal LED Light Box can be packed with corrugated box or honeycomb box according to different shipping needs.If there is specific requiry about the packing such as wooden case,we also can design for the packing according to your requiry.